At 3SB, our diverse team is passionate about delivering top-notch, relevant, creative workshops & stage shows that really impact your students. We are dedicated to fostering positive youth development while shining an updated light on Hip-Hop culture. We have a long history of working with young people and a genuine passion for youth culture. This focus has afforded us an up-close look at the challenges many Edmonton youth face every day. It is through our unique presentation in the areas of pop culture dance & music that our professional instructors are able to connect with and empower young people. Today, the television, radio, and internet are flooded with sounds and images of the hip-hop genre. But beyond the glamour and the glitz, what is hip-hop really about? Where did it originate? Who were its founders? What does it take to master its many forms of expression? 3rd Street Beat is your one-stop shop to learn all the top hip hop moves and sayings and put them into practice in a live performance setting. 3SB’s “Learn it, Live it, Perform it” program provides students of all ages with the opportunity to experience and enjoy many different forms of urban music and street dance expressions in a safe, respectful, and positive format. Each workshop or stage performance encompasses one or more of the many elements of “Hip Hop Culture” which embodies music, dance and visual arts. All of our presentations are unique and the overall theme of the session can be customized to fit the needs of your curriculum to promote: Anti-Bullying, Teamwork building, Character Development or Believe in Yourself! A team of dance instructors will teach your K-12 students high energy hip hop dance combinations & techniques to hip hop music. 1 or 2 week workshops also include a show & tell performance by the students. Our postitive teaching techniques are designed to improve rhythm, coordination,and self confidence. An exciting 1 hour interactive showcase designed for K-12 students! Including professional dance crews, a Breakdance crew, a live DJ and beatbox artist, students will participate in over 15 minutes of highly inter-active dance contests & games. 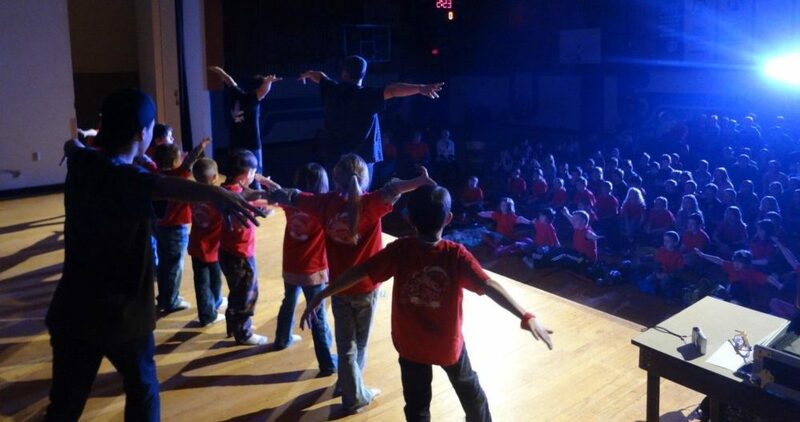 Give your students a true Hip Hop experience unlike any other in Western Canada! A complete hip hop package! The combo includes a custom length “learn it, live it!” workshop to get your students moving & a 1 hour “perform it!” showcase, with a twist! This exciting package allows your students to perform alongside our pros for their parents/teachers, friends & other students! There is also an interactive component that accompanies the showcase which involves the audience in fun contests and shout out games. Our team will also speak out on any relevant theme should the school request it.